This treatment is used to renew your skin’s surface with quick, visible results. It targets fine lines and deep wrinkles on the face and body, uneven skin texture and light and dark spots caused by sun damage. It is powered with fractional laser technology, it is the most advanced laser treatment on the market, with medical data to prove its effectiveness. Pearl is the “one laser to choose” to renew your skin’s surface with quick, visible results. Pearl treats fine lines on the face and neck, uneven skin texture and light and dark spots caused by sun damage. During a Pearl treatment, the top layer of the skin is treated with pulses of light. A portion of the epidermis is gently removed and a natural protective dressing is formed on the skin’s surface. After 3-4 days, the protective dressing peels off revealing new, healthy, vibrant skin underneath. The Pearl laser replaces the entire top sun-damaged layer of the skin with new healthy skin. Simultaneously, it sends heat to deeper layers of the skin stimulating new collagen growth, filling out and decreasing fine lines and wrinkles. New collagen growth continues for 4-6 weeks post-treatment. The combination of new skin and decreased wrinkles results in a healthier, more youthful appearance. 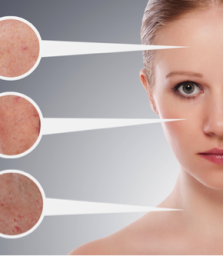 What is Pearl™ Laser Resurfacing used for? Patients of any age with sun damage, uneven skin texture and fine lines and wrinkles can benefit from Pearl treatments; however the most common age group seeking treatment is between 35-65. Does the Pearl™ treatment hurt? Most people report a feeling of the skin being pinched, however the numbing cream used on the surface of the skin reduces this feeling.